Two men have been charged with arson after a fire at a church in Leicester. Firefighters were called to St Augustine's Church on Fosse Road North at 1500 BST on 30 March. 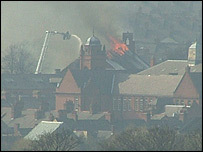 Around 80 firefighters were needed to extinguish the fire, and some nearby residents were evacuated for their safety. Two men, aged 18 and 19, have been charged with arson and are due to appear at Leicester Magistrate's Court on Thursday. The church had been closed for more than three years and was due to be converted into flats. It had been the target of arsonists on several occasions, a police spokesman said.